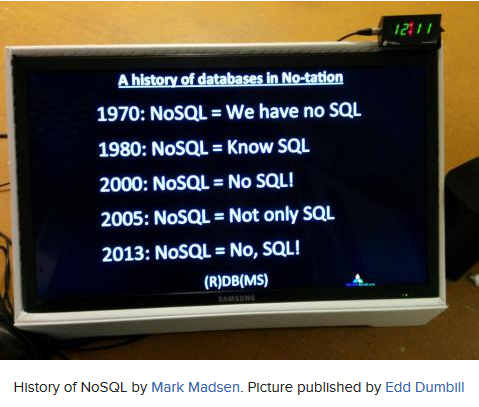 The question now is: what flavor of SQL is the SQL in “No, SQL!”? One alternative is to start from scratch and invent a SQL grammar and semantics that is not based on the existing SQL standard and SQL implementations. That would not be my choice at all, for the obvious reasons. Another alternative is to treat JSON ‘just’ as a data structure and embed it into existing SQL. This would be roughly the equivalent of the object/relational model (~NF2) with the variation that there is no global schema and some non-standard SQL types. The (in my opinion) better alternative is to look at JSON as more than just a data structure and combine JSON with the schema-per-document paradigm as the underlying philosophy. This would be a real game changer as it would cater to the dynamic changing JSON data structures as needed in many projects. As a result, the schema-per-document model would be integrated with the relational model so that a single database management system can support several data models and their paradigms concurrently. Supporting a schema-per-document philosophy requires extending the SQL semantics and its operators to be able to deal with the fact that different JSON structures might have a different schema, even if they are in the same collection or relational table. Operators like typeOf() come to mind that can test if a path into a JSON structure refers to a specific JSON type or JSON literal name. Another operator is exists() to test if a path into a JSON structure exists. Or array operators that can determine if an array contains a specific JSON structure as an element. containsPath() is an operator that checks if a JSON structure has the path given. Many more operators can be envisioned to make managing and querying JSON structures in context of SQL expressive and useful.